We start with the original A1A-A1A D600 Warship Class 41 and a short B&W sequence of D600 leaving Paddington with an express and then passing Par. A D6xx in green with a yellow warning panel passes Lostwithiel and along Dawlish Sea Wall. Green D601 “Ark Royal” on shed contrasts starkly to a later scene on the Barry scrap line with blue liveried D600 “Active”. 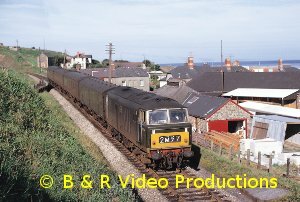 The Class 42/43 Warships, in both maroon and green, are seen on the GW Main Line & in the West Country including scenes at Dawlish, Penzance and Par. Over to Waterloo for Warships of all colours including a short cab ride in D809 “Champion” as it departs. Back to Paddington for Warships double-heading, a blue Warship crossing Saltash Bridge and green D850 at St.Erth. Inside Swindon Works for views of Class 52 Westerns being built. A rare shot of Desert Sand “Western Enterprise”. The comings & goings of a vast variety of maroon and blue Westerns on expresses at Paddington, out on the GW Main Line, Bristol, Dawlish Sea Wall, Newton Abbott, Plymouth and Penzance plus freight trains in the snow and china clay trains. Also featured are a number of rail tours such as “The Western Talisman” from Kings Cross and the “Western Finale”. Over 30-mins of pure Western nostalgia! We see NBL D63xx Class 22s shunting at Coleford and Boscarne Junction plus extensive footage of D6346 shunting at Charlbury! Scenes from a bygone era. Look out for the man with the pole! Finally, the Class 14 0-6-0 “Teddy Bears” and shunting at Coleford Junction and Lydney with D9555. Many Class 14s were sold into industry and we feature No.28 in industrial use. Apart from a few early scenes in black and white, most of the footage is in colour and the film has an extensively researched commentary with an authentic sound track. Jim Clemens Collection No.29. 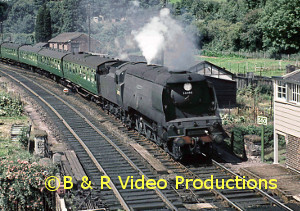 The first in a series featuring scenes of the former Great Western Railway using archive film from the 1920s all the way to the diesel hydraulic era in the 1960s. In this part we predominately feature express classes. The early GWR scenes are a complete contrast to steam on the Western Region in its last five years from 1960 to 1965 and this production is appropriate for the 175th anniversary year of the GWR. We start with a prelude of the broad gauge using the 1935 and 1985 re-enactments followed by extensive and detailed footage of the King, Castle and County 4-6-0 express classes. There are many scenes of these locomotives taken from all over the territories of the former GWR and Western Region of British Railways. From Paddington in London to Penzance in the Far West; to Worcester & Birmingham in the Midlands; to Swindon & Bristol; these are just few of the many locations visited. There are special events, tours and normal service train workings of both passenger and freight over this well loved railway. A short sequence features the early diesel hydraulics with D600s, Warships & Westerns. As a preview of Part 2, we conclude with views of Halls, Granges, Manors, Dukedogs, 2-8-0, 2-8-2T & 47xx freight classes & panniers plus a visit to the narrow gauge Welshpool and Llanfair line. Older scenes are in black and white but the majority is in colour. An extensively researched commentary has been added along with an authentic sound track. Cover photo:- Keith Pirt/Courtesy Booklaw Publications, 6008 “King James II” passes Lapworth, November 1961. Jim Clemens Collection No.23. A video film of JIM’s travels around BIRMINGHAM and south thereof, eventually reaching SWINDON and onto some Wiltshire branches. 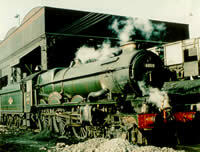 In 1963 a visit to SWINDON works with the last King Class 6018. Other visits there show County class and a Clan. A little of the M&SWJR to Swindon Town. The HIGHWORTH branch, Marlborough, Savernake and Calne. A look at Great Western locomotives at work from the South Midlands to South Wales. The large and the small are seen in this video starting at Oxford. The Fairford branch is covered in detail before going on to Birmingham via Banbury and scenes at Worcester. There are scenes at Swindon including the Works. Gloucester via Chalford leads us to Pontypool Road. Follow the route to Crumlin and Aberbeeg, coal trains from Blaenavon. There are panniers and Kings, Prairies and Castles to delight the GWR fans. A look at the Western Region of British Railways from 1958 to 1965 covering all the major classes of ex- GWR motive power. There is Paddington in all its steam glory with Kings, Castles, Halls and pannier tanks. 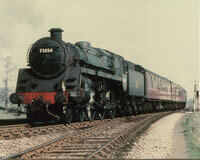 It was the starting point for a unique railtour in 1963 to Swindon Works behind 72006 “Clan Mackenzie”. We join the tour and see Swindon Works while it was still overhauling steam followed by a visit to the shed. A return to Paddington for lineside action through Westbourne Park in 1962, more Kings, Castles, County, Hall and a view of 4704 the ultimate 2-8-0 of the GWR. Westward via Southall in 1963 to Maidenhead and a nostalgic look at the Marlow branch and its “donkey”. 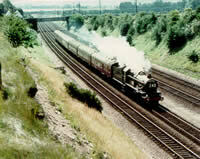 At Reading, also in 1963, more Castle action and a couple of SR engines pass through en-route to Moreton yards. Station pilot was 7817 “Garsington Manor”. Didcot provides us with another County class and the last GWR Castle “Great Western”. Sapperton for the Chalford auto trains lead on to the Birmingham route at Hatton and yet another rare event, Bulleid Pacific’s on football specials at Handsworth & Smethwick. Farewell to the Kings with 6018 to Swindon, then Oxford and the last steam train to Fishguard with 6859. Returning to London there is a look at the Brentford and Windsor branches before 7029′s last Farewell tour. Lots of copper caps and lower quadrants! A video of British Railways Standard Classes of locomotives introduced onto the main lines of Britain in 1951. By 1960, when 9F 92220 “Evening Star” emerged from Swindon Works, there were a total of 999 engines in 12 classes of 6 different wheel arrangements. 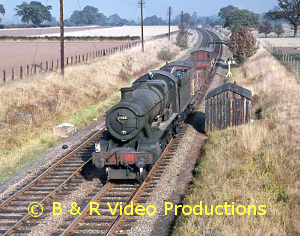 From an extensive archive collection of film we have been able to tell the story of these locomotives in great detail using only film from pre-1968 days, except in the case of 71000, even though we do portray her at Crewe in the early 1960′s. With this one exception, all the classes shown cover the varieties and workings of the locomotives within their class and after extensive research, we believe we have found most of them! From liveries to modifications and tender types you will find them in this video. From the foregoing, it is obvious that we cover the country from Scotland to Weymouth and West Wales to Tyne Dock since these locomotives were meant to traverse, within their limitations, the majority of lines on the BR network. Over 90 different engines appear in many locations. Good quality 8mm and 16mm film has been used in what is a completely different kind of video from our normal “area” type of film story. Some views have been seen in earlier releases. and some will be used in future productions, but here we see them in a completely new context, the real story of Standard Steam. With full electrification on the Southern main line to Weymouth now operating we return to Dorchester to witness the operation of steam trains reversing up workings at the ex-LSWR terminus. Southampton and Eastleigh in 1967 and steam’s last fling in the London suburbs on the LCGB 100th. railtour to Windsor and Reading using 77xxx, 76xxx, 80xxx and West Country complete this section. Tribute to a King. We profile 6000 “King George V” in its preservation life from 1970 to 1987 covering its travels to Paddington, Didcot, Swindon, Gloucester and the North-to-West route to Chester. 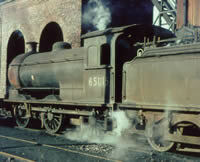 The trip for Swindon Borough in 1974 with unique smokebox side-plates is featured. Hard workings steam in the North-East of England in 1966/67 where ex-NER type Q6 and J27 locomotives worked to the last around the collieries of Tyne and Wear. The last Tyne Dock to Consett working with 92063 is seen complete with headboard. K1, WD 2-8-0, Q6 and J27 workings at Pelaw, Ryehope and Seaton Bank make this selection relive the days of steam as they really were. So popular was this section of the video with our customers that Volume 18 was devoted to this area for even morepower to the pit. Steam returned to the North Wales coast in the late `80s but we visit it in 1966 with an LCGB railtour along the coast and up the Conway Valley to Blaeneau Ffestiniog and Denbigh with Britannia, Crab and ex-LMS 2-6-4Ts. Soak up the steam atmosphere with LNWR signalling at Chester. We still had 3-minutes left to give a full hour so we inserted the industrial scene at Maerdy Colliery in 1970 when ex-GWR pannier tank 9792 breathed its last in the summer sunshine. To say it was in full steam would be an understatement!